MICHELLE IS THE STRIKER OF THE WESTFIELD MATILDAS, CANBERRA UNITED AND A BUDDING FASHION DESIGNER WITH HER OWN BRAND, MH23. in the W-League. She announced herself on the scene in 2009 when she won the Golden Boot for the most goals and Player of the Year award in the coveted W-League. 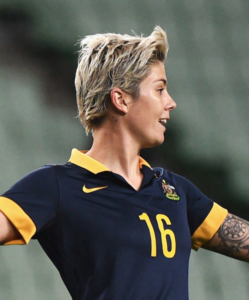 with her debut for Australia and she would go on to again be the W-League top scorer in the 2011-12 season. Her fifty-plus goals in Australia’s top women’s competition is unparalleled—the most ever in the W-League. two matches and came off the bench in Australia’s other three contests at the 2015 World Cup where Australia won their first ever knockout phase match at the competition. Recently, Michelle scored goals against Japan, Vietnam and North Korea at the Rio 2016 qualifiers to help her side secure their first Olympic Games appearance since Athens 2004. Michelle has existing ambassador roles with Concave and Woolworths where she represents those brands with pride both through appearances and her large social media following.